It’s time to for CBS to prepare fumigate the studio, Adam Schiff is joining Major Garrett as a guest on Face the Nation. Garrett introduces Schiff as “the top Democrat on the Intelligence Committee,” which is not unlike recognizing the largest tick on an ailing hound. Garrett reads a tweet sent by President Trump in response to the bad-faith effort on behalf of Schiff and his sleazy Democrat accomplices to release a rebuttal to the Republican memo, a document that could not be made public due to the Democrats having deliberately packed if full of classified information. It’s almost as if he’s able to read the minds and gauge the impulses of Republicans and patriots of every stripe in the audience when they see the Bobble-Headed subversive. Schiff replies, “The hypocrisy of this just kind of reaches out and grabs you by the throat.” Despised pencil-necks like him should be wary of using such tempting symbolism. Actually there were no statements to that effect with any specificity, the true omissions were made by the FBI in failing to disclose information to the FISA court when seeking warrants. 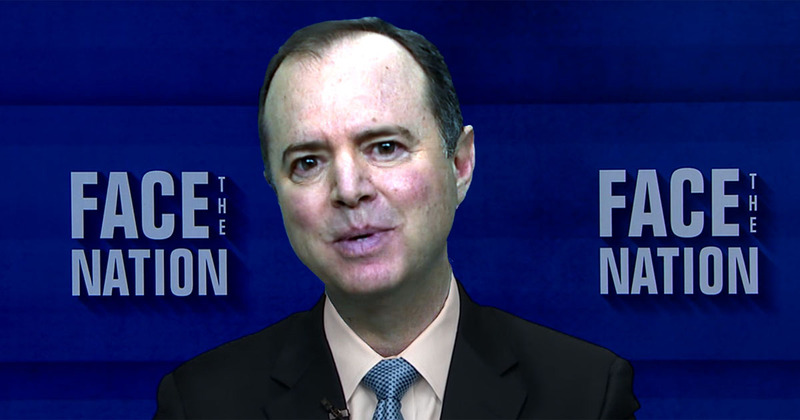 As he accuses Republicans of being misleading, it is Schiff who fails to note the hysterical claims of the compromising of sources and methods were a complete and total lie, and whose director, given the opportunity prior to the memo’s release, was unable to point to any component that compromised sources or methods. Schiff replies, “Yes we did, yes we did, unlike the Republicans.” Of course the obvious question is if they already removed the offending content how did it wind up back in their report? He then goes on to say that they asked the FBI for input before the memo was even written so the actual answer to Garrett’s question is “No, we did not,” with an added qualifier of “We ignored the FBI for the sake of political theatrics.” He can answer as he chooses, Garrett doesn’t call him on it, he’s not there to discredit the Bobble-Head and his witch hunt. The Bobble-Head has failed to produce any evidence of Russian collusion by the Trump campaign, yet he has the gall to say, “The president doesn’t want the public to see the underlying facts.” He alludes to the contents of his memo demonstrating how “misleading the Republicans have been,” when he’s been the primary witch hunt cheerleader for over a year, with absolutely no evidence having yet been produced despite his assertions that there was evidence of wrongdoing. Schiff and the Democrats are the ones who don’t want the public to know about their criminality on so many levels. The Republicans are simply trying to get the facts out there so that this arrogant hatchet man and those he’s working for face the justice they believe they are above, subscribing to the motto that lies conquer all. ScHifT looks like the Peanuts Character ‘Charlie Brown’—–Is this a coincidence or dejevue ? Have you noticed that Wray has become a back stabber too. Goes to show you, you can’t trust anybody. I don’t know how it should be handled but if I were Trump I would have Black marked the security issues the FBI reviewed, and indicated why they were a security issue. Then stated that the little Schiff head was compromising National Security by trying to publish sensitive information to Falsify The Memo. We are seeing the biggest ping pong match in history, bigly, wonderful.